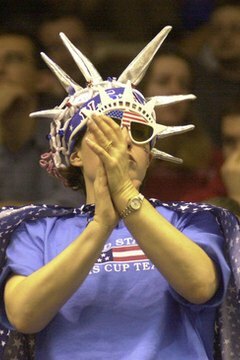 The outlandish outfits some fans where at other sporting events are generally frowned upon at most professional golf events. Golfers pride themselves on the etiquette that is displayed on the course, earning it the label "the gentleman's game." When attending a professional golf event, such as a stop on the PGA Tour, there are rules of etiquette that exist between players and their playing partners, between the other players in the tournament and between them and the fans in the gallery. As is the case with simply two friends out playing a light-hearted round together, players on a professional golf tour are expected to treat the playing partners in the group with respect and to not interfere with each other's shots in any way. This includes being quiet when another player is taking his shot and waiting for his turn to shoot. Additionally, in the event of a ball being lost and a player searching for it, it is not uncommon for a player in the group to assist in the search, as the player attempts to locate his ball before it is lost. In addition to showing respect to the players in a group with them, players are expected to show the proper respect to the other players out on the course with them at all times. While the professional herself will not often be responsible for physically performing the act, as caddies will often tend to such issues, it is the golfer's responsibility to ensure that any disturbances caused by her play, such as shots out of a bunker or ball marks on the green, are repaired before progressing on. Also, players should always be sure the group ahead of him is out of range before he takes his shot. The PGA Tour strives to ensure that all the fans who have come out to witness the events have an enjoyable experience. A large part of this is ensuring that the professional players behave in a manner that will not cause offense to the paying fans. Often, during practice rounds or early week sessions, golfers will be available to interact with fans, and even after the tournament has begun and the pressure is on, it is frowned upon for golfers to swear or otherwise behave in an unsporting manner in front of the fans. In return for the respect paid to them by the players, the fans are expected to respect the importance of the shots being played by the golfers. With prestigious titles on the line, in addition to large sums of money, it is important that all players be given a fair playing field, which includes no disturbances from members of the gallery, be they unwelcome physical altercations or making loud noises or distracting gestures while a player is attempting to take a shot. Fans are also expected to be polite and take into account the other fans in the area around them. Conversations should be kept appropriate for all ages, as many young children attend events with their parents, and the quiet on the course means inappropriate conversations can be overheard at a greater distance than most spectator sports. Additionally, fans are expected to dress in golf course-appropriate attire, which includes shirts.